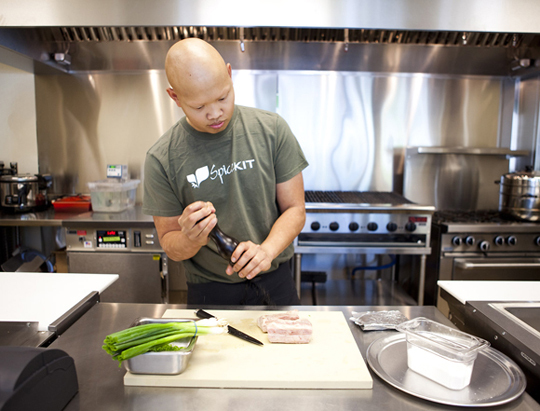 Spice Kit in San Francisco’s South of Market neighborhood is not your average sandwich joint. Not with its state-of-the-art sous vide equipment in the kitchen. And not with a founder, who used to work at the French Laundry in Yountville, and a chef, who hails from the celebrated Dining Room at the Ritz-Carlton in San Francisco. 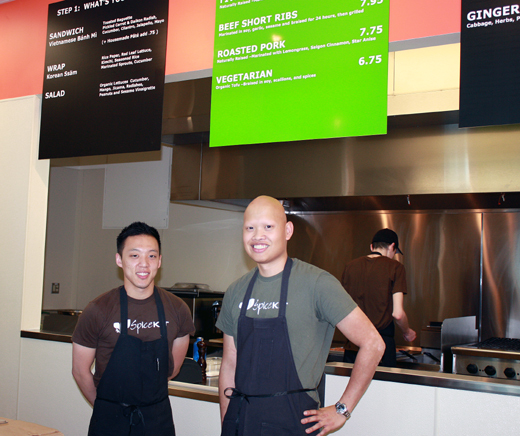 The duo, which opened Spice Kit two months ago, near the Hotel Vitale, is elevating the bold, irresistible flavors of Korean, Chinese and Vietnamese street food to a higher level with organic tofu, organic greens and high-quality meats. They even make their own paté in-house for the banh mi sammies. How could I refuse? 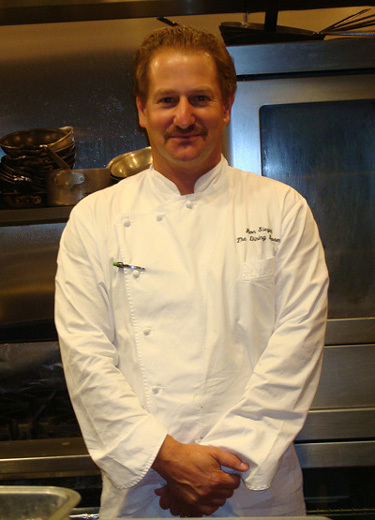 Especially when French Laundry chef de cuisine alums, Corey Lee of the new, nearby Benu restaurant in San Francisco, and Ron Siegel of the Dining Room, have already been in for their fill? In fact, here’s a pic of Siegel placing his order at the counter. The fast-casual spot offers salads, banh mi and ssams (Korean wraps) with your choice of five-spice chicken, beef short ribs, roasted pork or tofu. The prices are higher than your typical Mom-and-Pop Vietnamese cafe, but the most expensive item is only $7.95. 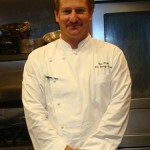 And the caliber of ingredients and cooking really shines through. 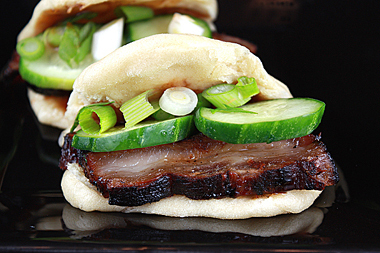 Don’t miss the fabulous steamed pork buns ($2.95 each or two for $5), filled with grilled pork belly that practically squirts juice when you bite into it, as well as a smear of sweet, thick hoisin sauce and crunchy pickled cucumbers. The buns, themselves, are delightfully fluffy and unbelievably fresh tasting. 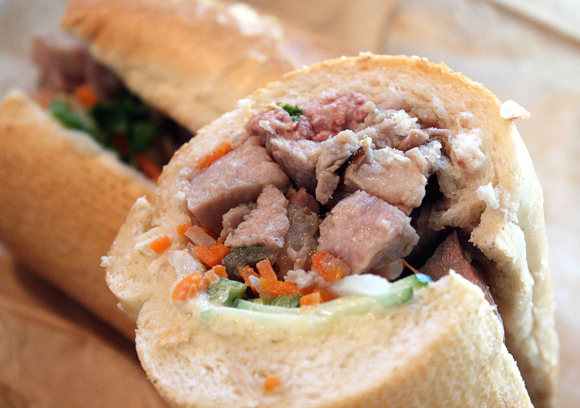 The pork in the banh mi was again a cut above, marinated in lemongrass, then braised until super tender and juicy — not the least bit dry, which is so often the case with a lot of roast pork at Asian delis. The creamy, rich, slightly musky tasting paté (75 cents extra) made the French roll sandwich even more satisfying. The ssam is made to order and it shows with its soft, still pliable rice paper wrapper that didn’t suffer whatsoever from hardening, as tends to happen to this delicate, thin wrapper if it sits around too long. 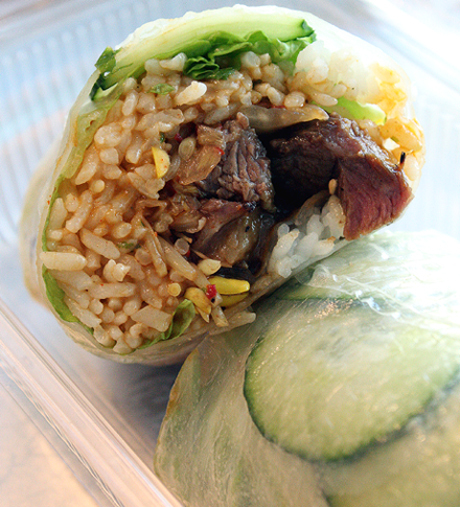 Think of it as a Korean burrito, filled with red leaf lettuce, cucumbers, seasoned rice, marinated bean sprouts, kimchi, housemade ssam sauce, and our choice of beef short ribs. With each bite, it was at once crunchy, juicy, tender, spicy, tangy and a little sweet. For those who want more heat, an arsenal of Sriracha bottles is available at the counter. 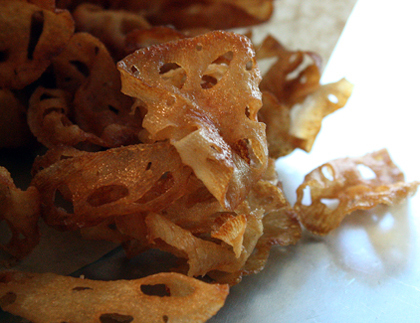 Lotus chips ($1.50) are offered as a nice alternative to potato ones. These are dainty in size, crisp and perfectly salted. With the exception of the refreshing calamansi limeade ($1.95) offered, there are no nods to Pacio’s Filipino-American heritage on the menu. 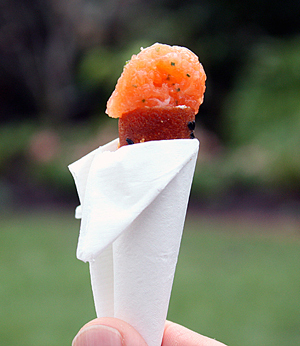 He has mulled over some possibilities, he says, including hearts of palm lumpia. But he worries that with so many Filipino specialties being fried, it might be too unhealthy to go in that direction. I dunno. With folks lining up for those lusciously fatty pork belly buns — including a catering order of about 100 of them the day I was there — I think customers just might be willing to put off their diet for a day for food this tasty. In fact, I’d bet on it. Oh wow! I am going to try this place next week! Have colleagues in from London and we were triyng to find good lunch places – this is going to be one! This restaurant again proves that with the right limited menu, the use of impeccable ingredients, and the proper dedication to efficient service a successful restaurant in these difficult times is possible. It sounds so easy but is so difficult to execute. Kudos to them. Can’t wait to try. Did you eat all that yourself! I commend you! I think even though the prices are higher than your mom-and-pop spots in the Tenderloin, they really do stuff it with a lot of food, especially the ssam. I had the 5-spice chicken and I have to say the spice mix was a bit too much for me. Now I think I have to go and try the pork, and maybe a couple of those buns! Ooooh, I can’t wait to go there when I’m in SoMa next. I haven’t had a good banh mi in soooo long. 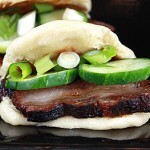 I am drooling at those pork belly buns! 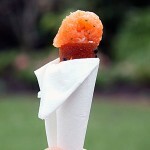 It is childhood food for me – my grandmother used to make them. This place sounds wonderful! That picture at the top has me swooning. And lotus chips sound delicious…and much more fun than potato chips! The banh mi and ssams look incredible here! OK that’s it. I’m no longer reading your site unless I have something delicious in front of me 😛 Because a) it makes me hungry and b) the food featured is an ocean’s away! Oh my lord. I love really good meaty sandwiches but these take that to a whole other level with MANY other flavors! Delicious. I’m recommending this place to my old roommate who lives in SF. She loves a good sandwich! Whhyyyyy must this be so far away! Those pork buns and lotus chips look wicked! I wish we had a place like that in my neck of the woods. What drool worthy picutres! I hate living out in the boonies when I see all the delicious food other people get to eat in the city… but then I’d probably also weigh a good 100 pounds more. ohhh! I am jealous of where you live. I would move to SF JUST for the food. 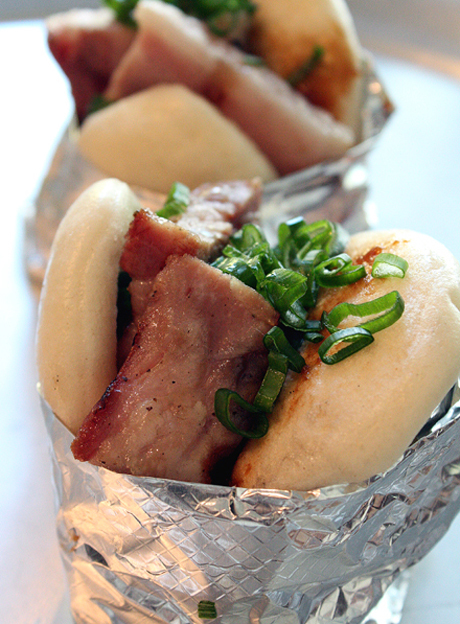 AND, you can never go wrong with pork buns. YUM!!! 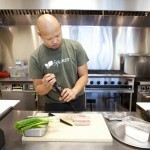 I am going back to San Francisco this coming March-will definitely go to Spice Kit. There are too many good eating establishments there-it would take forever to get to them all! this is just terrific! 😉 nice to see of cush simple and yet delicious food. such an envy! We will be visiting with Will, who is from NW Ohio, as we are. I will make a huge detour to check this place out – it sounds simply amazing. The photos looked just terrific. The best sandwich place I have ever been to is Melt Sandwiches in White Plains, NY. All the meat is smoked on premises and the chef makes amazing sauce/topping combinations. Hands down my favorite sandwiches!